Let’s dispel the myth of the base tan once and for all. It’s not a gentler, safer way to go about getting a summer glow. As healthy as it may look, a tan is always an indication of skin damage. The Centers for Disease Control and Prevention actually describes it as the skin’s response to injury. Even more, that damage is cumulative. So all the sun burns and tans you get during your teens and twenties will affect your skin for years to come, significantly increasing your risk of skin cancer and accelerating the aging process. So wearing sunscreen every single day is no longer up for discussion. The only real question is which kind is right for you. We’ll get to that in a moment. But first, a quick primer on SPF. SPF (sun protection factor) is a relative measure of how long a sunscreen will protect you from ultraviolet (UV) B rays, the leading culprit of sunburns. UVB rays tend to damage the skin’s outer layers, or epidermis, where the most common forms of skin cancers occur. They’re the ones linked to sun-accumulation over the years. Melanoma, another type of skin cancer, is thought to be caused by short, intense exposures, like a blistering sunburn. In theory, if you’d burn after 20 minutes in the sun, an SPF 30 sunscreen would protect you for about 10 hours. But the intensity of UVB rays varies throughout the day and by location. Plus, that math doesn’t apply to UVA rays. A broad-spectrum sunscreen protects against UVB and UVA rays. A sunscreen with higher SPF protection and broad-spectrum coverage will provide more protection against sunburn, UVB damage and the DNA damage caused by UVA rays (AKA, tanning). But that’s in an ideal setting, like a lab. The Great Outdoors are far more unpredictable. So which sunscreen is right for you? For starters, don’t be lulled into a false sense of security by a high SPF. It’s an easy mistake to make. You slather on an SPF 50-sunscreen in the morning and figure you’re safe for the day. 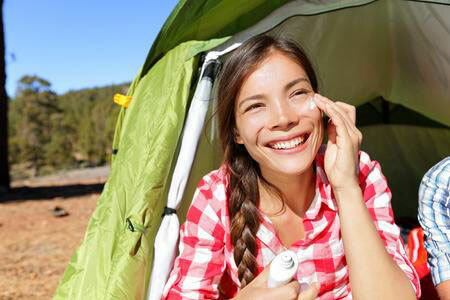 You’ll stay in the sun longer than you should and forget about reapplying every couple of hours, as you should be. No sunscreen blocks 100 percent of UVB rays, and ultrahigh SPFs aren’t much more protective than SPFs of 30 or 50. SPF 15, for example, blocks 93 percent of UVB rays. SPF 30 blocks 97 percent. The increase in protection is even more gradual after that. A water-resistant, broad-spectrum sunscreen with an SPF of 30 is a good place to start if you’re planning to be outside for more than an hour at a time. If you have a history or high risk of skin cancer, go with an SPF of at least 50. Even then, the sunscreen’s only go to be so effective. It’s important to apply an ounce (two tablespoons) a half-hour before you head outside and reapply it every two hours from there. Ignorance can’t be an excuse anymore. There’s just too much at stake.